The 40th anniversary reprint of the original, classic study, Indian Fishing,has arrived. Its author is the multi-talented graphic artist, photographer, archeological fieldworker/ethnographer, and museum exhibit curator, the late Hilary Stewart. For only one of these many skills had the author ever received formal training: drawing. In the 1970s, Indian Fishing launched Stewart’s late career as a fulltime writer and graphic artist of distinction who became an important authority on, and advocate for, the archeology, art, culture, and technology of Northwest coast First Nations. 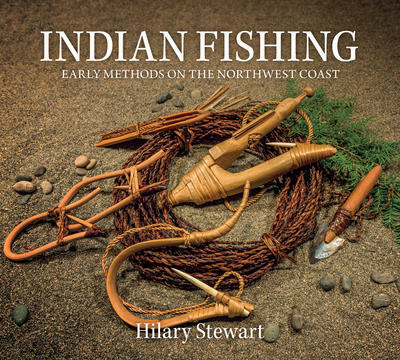 With Early Fishing Stewart perfected a style of researching and presenting the material culture of the Northwest coast: she combed libraries and museums for historic images and sample objects, collaborated with experts, and conducted interviews in the field to recover lost and fading knowledge of traditional fishing and fish processing and cooking. Out of this information she penned archeological field illustrations that are meticulously detailed and documented as to key reference works, museum collections, and the cultural or linguistic group origins of specific artifacts, and she matched them with prose that is unfailingly clear and vibrant. She also fascinated readers with accounts of her forays into experimental archeology, her “hands on” experiments with making, using, and testing the workability of specific technologies. So thorough is the author in her approach to the subject of early fishing that when she discusses, for example, the production of traditional fibre nets and wooden hooks she makes educated guesses about the plant knowledge and weaving skills of their makers. It is around types of gear by methods used that the chapters are organized. The chapter on hooks and lines, for example, contains the story of the North Pacific Halibut. Among the largest fish species on the Northwest coast, halibut ran up to 200lb each. The story focuses on “one of the most interesting and beautiful of all the fish hooks”: the traditional, large 2-piece, V-shaped hook used by northern peoples for halibut. It also includes the author’s intriguing examination, under controlled conditions, in halibut tanks, of all aspects of the operation: from how halibut actually take the bait and what happens to the floating action of the hook when iron begins to replace bone for barbs, to descriptive details of the typical decorative figures carved on the free arm of the hook and the recounting of the stories that are told over the floats and spirit helpers during fishing. For her experimental work, Steward made the hooks and decorative carvings; conducted the experiments; and repeated the ancient stories she was taught in the coastal communities. Stewart’s nine books with the same publisher have sold over 600,000 in 10 countries and been translated into several languages. The books have over the decades led to book tours and lecture seminars, curated fishing exhibits, and study programs. 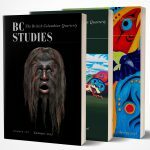 And as books, they seem never to have lost their appeal with people of the Northwest coast, from First Nations artists and school children, to academic scholars and the regional archeological community, to the general public at large. Vancouver and Seattle: Douglas & McIntyre and University of Washington Press, 2018. 40thanniversary edition. 184 pp. $28.95 paper.